The Mexican government has said that it wishes to question Penn. DEEP IN THE Mexican jungle US actor Sean Penn met with drug lord Joaquin “El Chapo” Guzman in October, gathering material for an article that was published Saturday, after the capo’s arrest. The Mexican government, which says it knew of the meeting, wants to question Penn while the White House has remained mostly mum and analysts say Penn has not likely done anything illegal. According to the article, written by Penn and published in Rolling Stone magazine, the Hollywood star landed October 2 in Mexico, where he and Mexican actress Kate del Castillo were ushered to meet Guzman in the jungle. To land the interview, Penn says, he rode “on the coattails of El Chapo’s faith in Kate,” the Mexican soap opera star who once played a drug baron and had caught Guzman’s attention. During “a seven-hour sit-down,” carried out in part over sips of tequila, Penn said he held off on hard-hitting questions, expecting to interview the world’s most wanted drug baron in full eight days later. By that time, however, the situation had changed, Guzman was no longer available, and the drug lord would go on to answer Penn’s questions via video recordings without the Hollywood star present. The Rolling Stone article came out one day after authorities arrested Guzman in a military raid early Friday that left five suspects dead in Los Mochis, a coastal city in his native northwestern state of Sinaloa. Authorities were able to locate Guzman, in part, because he wanted to make a biographical film and had “established contact with actresses and producers,” Attorney General Arely Gomez said before the article’s release. Following his capture, the Sinaloa cartel kingpin was flown back to the Altiplano maximum-security prison, some 90 kilometers west of the capital, from which he had escaped in July. After just 17 months at Altiplano, Guzman slipped through a hole in his cell’s shower on 11 July, climbed on a motorcycle mounted on rails, and traveled 1.5 kilometers through a tunnel to freedom. Guzman had been captured on February 22, 2014 in the Sinaloa resort of Mazatlan after 13 years on the lam. He escaped a first time in 2001 from another prison by hiding in a laundry cart, having spent eight years in jail following his 1993 capture in Guatemala. A Mexican federal official told AFP on Saturday that authorities had known about Penn’s meeting with Guzman before his capture, and that it was a part of the investigation that helped lead to the drug lord’s apprehension. On Sunday a federal official told AFP that the Mexican attorney general’s office wanted to talk with Penn and del Castillo about their secretive meeting. “It’s to determine responsibilities,” the official said on condition of anonymity, declining to provide more details. Meanwhile Mexican authorities formally launched the process of shipping Guzman to the United States by sending Interpol Mexico agents to Guzman’s prison to execute two arrest warrants for his extradition. Judges will now have to issue a ruling and hand it over to the foreign ministry, which gives the green light for any extradition. The bid marks a reversal from President Enrique Pena Nieto’s refusal to send Guzman across the border prior to the drug lord’s July escape from the maximum-security prison. Mexico received two US extradition requests last year on a slew of charges, including drug trafficking and homicide. Guzman is wanted in a half-dozen US states. 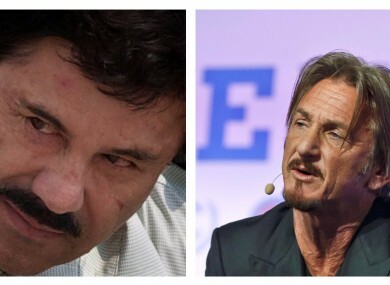 Email “Here is what happened when Sean Penn met the world's most notorious drug lord ”. Feedback on “Here is what happened when Sean Penn met the world's most notorious drug lord ”.